Lincoln at Old Town luxury renovated apartment homes, located in the heart of Alexandria, VA feature finishes and amenities that are sure to satisfy everyone. This pet-friendly apartment community near Old Town offers a relaxing courtyard with a fire pit, swimming pool with sundeck, two BBQ grills, fitness center, and a clubhouse with WiFi, all within walking distance to King Street or Eisenhower Metro Stations and a number of restaurants and a Whole Foods grocery store. Lincoln at Old Town is your destination address in Virginia. Nestled on the banks of the Potomac River and just 20 minutes from Downtown Washington D.C., Lincoln at Old Town provides you with an ideally situated Alexandria living experience. Enjoy premium shopping, dining, and a variety of entertainment close to home when you take a stroll down King Street in Old Downtown. Our community is surrounded by a variety of employers within walking distance including the US Patent and Trademark Office and the newly constructed National Science Foundation. For your traveling convenience we are also just a few minutes from Ronald Reagan Washington National Airport. Choose from our elegant studio, one-, and two-bedroom homes offering up to 1,045 square feet of unparalleled living space. 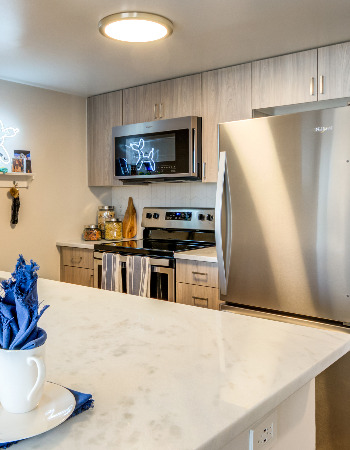 With a trendy atmosphere and polished interior finishes, you are sure to feel at home. Come home to plush wall-to-wall carpeting, top-of-the-line kitchens filled with state-of-the-art appliances, glass-enclosed sunrooms, walk-in closets, and more, with renovated homes available that feature stainless steel appliances, elegant kitchen backsplashes, wood-laminate flooring and high-end cabinetry and lighting. Experience large windows with breathtaking views of Washington D.C. and Old Town Alexandria. With other great options like soaring ten-foot ceilings, cozy fireplaces, and available furnished apartments, you can customize the living experience that's just right for you. Rest easy with 24-hour emergency maintenance, controlled access to the building, and a convenient elevator, among a variety of other great community amenities. Features like complimentary coffee service, community resident events, and guest suite accommodations are sure to make you feel at home. Come see these features and so many more when you come visit Lincoln at Old Town and take a guided tour of our community.